Insanity, craziness or madness is a spectrum of behaviors characterized by certain abnormal mental or behavioral patterns. Insanity may manifest as violations of societal norms, including becoming a danger to themselves and others, though not all such acts are considered insanity. In modern usage insanity is most commonly encountered as an informal unscientific term denoting mental instability, or in the narrow legal context of the insanity defense. In the medical profession the term is now avoided in favor of diagnoses of specific mental illness such as schizophrenia and other psychotic disorders. When discussing mental illness in general terms, "psychopathology" is considered a preferred descriptor. In English, the word "sane" derives from the Latin adjective sanus meaning "healthy". The phrase "mens sana in corpore sano" is often translated to mean a "healthy mind in a healthy body". From this perspective, insanity can be considered as poor health of the mind, not necessarily of the brain as an organ (although that can affect mental health), but rather refers to defective function of mental processes such as reasoning. A Latin phrase for "sane" is "compos mentis" (lit. "of composed mind"), and a euphemistic term for insanity is "non compos mentis". In law, mens rea means having had criminal intent, or a guilty mind, when the act (actus reus) was committed. Insanity is no longer considered a medical diagnosis but is a legal term in the United States, stemming from its original use in common law. The disorders formerly encompassed by the term covered a wide range of mental disorders now diagnosed as organic brain syndromes, schizophrenia, bipolar disorder and other psychotic disorders. 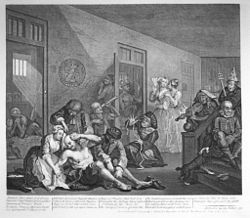 During the 18th century, the French and the British introduced humane treatment of the clinically insane, though the criteria for diagnosis and placement in an asylum were considerably looser than today, often including such conditions as Speech disorder [speech impediments], epilepsy and depression. Europe's oldest asylum is the Bethlem Royal Hospital of London , also known as Bedlam, which began admitting the mentally ill in 1403. The first American asylum was built in Williamsburg, Virginia , circa 1773. Before the 19th century these hospitals were used to isolate the mentally ill or the socially ostracized from society rather than cure them or maintain their health. Pictures from this era portrayed patients bound with rope or chains, often to beds or walls, or restrained in straitjackets. In United States criminal law, insanity may serve as an affirmative defense to criminal acts and thus does not need to negate an element of the prosecution's case such as general or specific intent. The States differ somewhat in their definition of insanity but most follow the guidelines of the Model Penal Code. All jurisdictions require a sanity evaluation to address the question first of whether or not the defendant has a mental illness. Most courts accept a major mental illness such as psychosis but will not accept the diagnosis of a personality disorder for the purposes of an insanity defense. The second question is whether the mental illness interfered with the defendant's ability to distinguish right from wrong. That is, did the defendant know that the alleged behavior was against the law at the time the offense was committed. Additionally, some jurisdictions add the question of whether or not the defendant was in control of their behavior at the time of the offense. For example, if the defendant was compelled by some aspect of their mental illness to commit the illegal act, the defendant could be evaluated as not in control of their behavior at the time of the offense. The forensic mental health specialists submit their evaluations to the court. Since the question of sanity or insanity is a legal question and not a medical one, the judge and or jury will make the final decision regarding the defendant's status regarding an insanity defense. In most jurisdictions within the United States, if the insanity plea is accepted, the defendant is committed to a psychiatric institution for at least 60 days for further evaluation, and then reevaluated at least yearly after that. Insanity is generally no defense in a civil lawsuit. However, in civil cases, the insanity of the plaintiff can toll the statute of limitations for filing a suit until the plaintiff has recovered from this condition, or until a statute of repose has run. Feigned insanity is the simulation of mental illness in order to avoid or lessen the consequences of a confrontation or conviction for an alleged crime. A number of treatises on medical jurisprudence were written during the nineteenth century, the most famous of which was Isaac Ray in 1838 (fifth edition 1871); others include Ryan (1832), Taylor (1845), Wharton and Stille (1855), Ordronaux (1869), Meymott (1882). The typical techniques as outlined in these works are the background for Dr. Neil S. Kaye's widely recognized guidelines that indicate an attempt to feign insanity. Today feigned insanity is considered malingering. In a 2005 court case, United States v. Binion, the defendant was prosecuted and convicted for obstruction of justice (adding to his original sentence) because he feigned insanity in a Competency to Stand Trial evaluation. An interview with Dr. Joseph Merlino, David Shankbone, Wikinews, October 5, 2007. Rosenhan, David L. "On Being Sane in Insane Places."